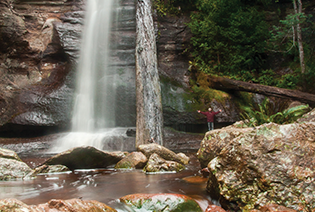 Road access to the waterfall is on Snug Falls Rd, an excellent unsealed road that stems from Snug Tiers Rd. This return track gradually descends through bushland to the cool, fern lined gully beneath delightful Snug Falls. Keep a look out for native orchids during spring and summer. In winter, eastern spinebills frequent the area, feeding on the pink and white flowering heath.